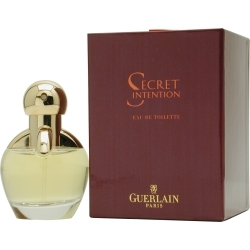 Secret Intention – a rarely-seen limited edition release from the revered house of Guerlain, was conjured by Guerlain heir and nose, Jean Paul Guerlain and was launched for a short period in 2001. A radiant floral, Secret Intention shares some DNA with its older Guerlain sibling, Champs-Elysees. This is a perfume composed from striking citruses whose presence are felt right out of the bottle as bergamot and lemon provide a zesty, tangy flight. Green herbaceous notes of coriander and green tea lend a sense of aromatic subtlety to the opening before a profusion of florals shift to the fore. Jasmine, peony and neroli play an important role in keeping Secret Intention resolutely feminine. The base is composed of sandalwood, vanilla and tonka, and these notes lend a saccharine sweetness, as opposed to a feeling of grounded earthiness. Secret Intention is bright and brassy and unapologetic. She has above average longevity and projection.